In the period between Christmas and New Year’s Day is when I feel motivated to declutter. It has a strange feeling where time seems to stand still and you’re never sure what day or hour it is; as if the whole world is in limbo waiting for the new year to start. I make the most of this downtown by getting rid of anything I no longer want or need so I can step into the new year without any clutter. 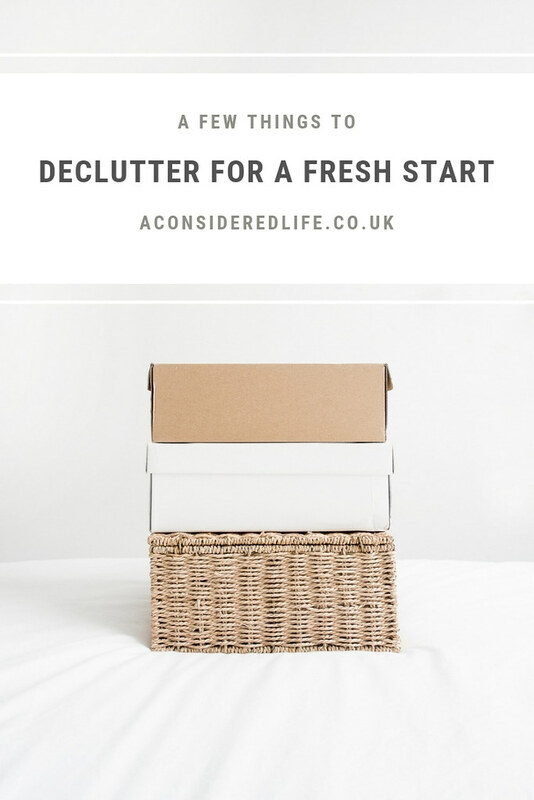 I’m sharing a few of the things I’ve decluttered recently, in the hopes that sharing encourages you to let go of the things you’ve been hanging onto, for a fresh start. I didn’t have a Christmas tree last year (I decorated one of my fiddle leaf figs) and I don’t envision having one this year. Before packing up the handful of festive decorations on display, I went through the small box of items I own and didn't use. I’m hanging onto the baubles for now, just in case I change my mind about having a Christmas tree; aside from a few decorations handmade by friends and family, everything else went into a bag for the charity shop. This is one of those tasks I wish I had done before December, donating decorations after Christmas feels like a missed opportunity but I'm glad it's done now. Even when I’ve been really careful about what I buy, over the course of a year I always find myself with a few clothing items I’m happy to let go. Even clothes you love and wear every day eventually stop fitting so well and stop being your favourite. Clothes wear out, your style changes or your life does, and then it’s time to let these items go. My wardrobe tends to get bloated with second-hand pieces (it’s hard to refuse when they’re so cheap) and gifted items that didn’t work out. I did a thorough wardrobe audit, decluttered the excess and unwanted, and gave the a handful of items to a local charity shop. What went into the donation pile were mostly cookbooks. My partner, Jack, does the majority of the cooking and he never uses cookbooks preferring to figure things out and make it up as he goes. Having been gifted a stack of cookbooks over the years, we’ve shamefully never even looked at most of them. Stacked up in our tiny kitchen, it was time for them to go. I also decluttered a small stack of my books. I find GoodReads is useful as a placeholder for book I love and struggle to let go. I can look over the ones I’ve enjoyed reading and remember them without having to own a physical copy, it makes it easier to pass them on. 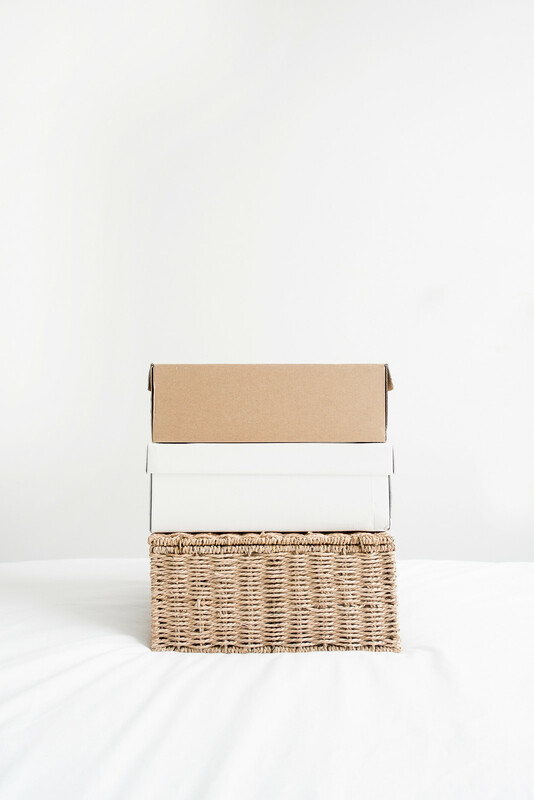 While decluttering my wardrobe and the kitchen cupboards feels liberating, decluttering digital files drains the life out of me but it’s such an important task. I started by emptying my email inboxes; replying, archiving, and (more often than not) deleting. I organised my photographs into folders and saved them to cloud storage, and did the same thing with photographs stored on my phone. I cleared my computer’s desktop, checked for software updates, and cancelled any online subscriptions I didn’t want to roll over into the new year. The benefit of this decluttering task is you get to look over all the experiences you've had and memories you've made throughout the year. There were a few things kicking about my apartment that I’d vowed to make use of over the year and never did, things like extra stationery, an old lamp, an alarm clock, and a few home decor items. I wanted to reclaim the space they were taking up and get rid of them for good. Some of these items could have been sold online for a good price but sometimes it’s more important to get rid of them than spend the time trying to sell them. I passed on the lamp and alarm clock directly to people who wanted them, and donated the rest to local charity shops. Getting these miscellaneous out of my cupboards and drawers and reclaiming that space back felt amazing. How are you tackling your clutter?